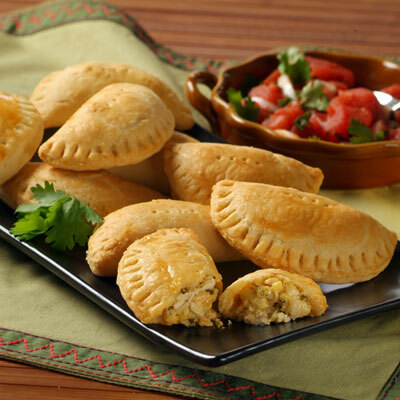 These baked chicken and cheese empanadas are a great way to use up leftover cooked chicken. For best results, do not overfill them or the dough may tear. PLACE flour, baking powder and salt in food processor; process for 5 seconds. Add shortening; process until the mixture looks like cornmeal. With the machine running, add the warm evaporated milk through the feed tube; process until dough almost gathers into a ball. (You may need to add a tablespoon or so of water). Transfer to a floured surface; knead for a few seconds. Cover with plastic wrap; let stand for 30 minutes. HEAT butter over medium high heat in medium skillet. Cook onion and garlic until onion is softened. Stir in evaporated milk, chicken, cilantro, bouillon and pepper; cook for about 3 minutes. Stir in cheese, mixing well. Remove from heat. Let cool. PREHEAT oven to 350º F. Lightly grease baking sheet. FORM dough into 9-inch log; cut into 12 portions about 3/4-inch each. On a lightly floured surface, roll portion with a rolling pin out to 1/4-inch thick. Cut dough into 4-inch circle using a wide-mouth glass, jar or can. (You may get an additional 4 circles by rolling out left over dough). Lightly brush the edge of half the circle with egg white mixture. PLACE about 1 heaping teaspoon of the chicken filling in the center. Fold half of the circle over to form a half-moon; press the edges together firmly. (Overfilling will cause dough to tear and not seal.) Gently press end of fork into dough to form ridges, if desired. Repeat with remaining dough and filling. Place on prepared baking sheet. Brush tops with egg white mixture. Pierce tops of empanadas once with a fork. BAKE for about 20 minutes or until lightly browned. Remove from oven; let cool for 5 minutes before serving. Unbaked empanadas may be frozen. Freeze on baking sheet lined with wax paper until hard. Store in freezer containers. Bake frozen; add additional 5 minutes to bake time. Fill empanadas with 1 heaping teaspoon of pineapple jam for a sweet treat or try the popular version with Costa Rican white spaghetti squash, chiverre.